Just a note to say that due to a long weekend, we'll be back on Thursday next week. 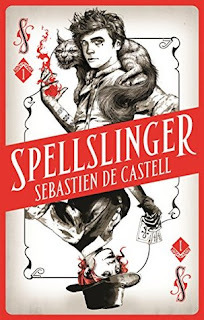 Spellslinger is the first in a new fantasy series from Sebastien De Castell, whose ongoing ‘Greatcoats’ series I’ve thoroughly enjoyed in the past. The world of Spellslinger is something a bit different from DeCastell’s last work. 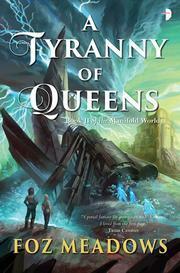 In some ways, it has a high fantasy influence. There’s a society ruled by mages, those with the power to shape reality to their whim. Within that society, situated around an oasis, are others – the disenfranchised, those with no magic, the servants to those more than happy to set them on fire on a whim. This is a culture which feels both calcified and paranoid. There’s a central set of families, cloaked in magic, happy to eliminate outsiders to protect their privilege, and then stick the knife into the leaders next to them. The reader is embedded in this niche, following one of the sons of power, seeing privilege at work. That magic has the potential to bestow exceedingly long lifespans is another side-note, another ossification of existing power structures. There are suggestions of other cultures outside of this one of course, beyond the reach of magic and paranoid insularity. There are some outspoken characters, swaggerers with their metaphorical (and sometimes literal) hat pulled over their eyes, unwilling to take any crap from wizards and their odd social expectations. If the oasis of magery can be likened to Victorian Britain – with all the inbreeding and plutocracy which that implies – its neighbours are something more of the wild west. There’s an energy there, in the small titbits we receive, an enthusiasm for grasping opportunities which the mage-lords seem to feel is beneath them. Still, the overarching society in the narrative, the one on which we focus our attention, is that of the mages – which is socially stratified, petrified and prone to responding to the potential for change with extreme thaumaturgical violence. The protagonist is the teenage son of one of the pre-eminent mage clans, as yet unable to use his magic, and rather concerned about it. Those from the nobility who are not magic users are sent out into the servant class – no longer family, they may be trusted to serve an un-poisoned breakfast. 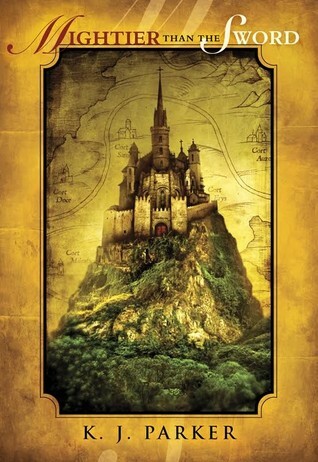 Kellen is wry, with a burgeoning cynicism typical for his mid-teen age, and at least initially seems unconscious of the gilded had which fate has dealt him. He’s certainly clever, given to thinking (or perhaps overthinking) through his actions and their consequences. At the same time, he can be driven to impulsive moves under emotional strain. It’s interesting to watch Kellen’s journey over the course of the text – less one of maturity, and more realising the reality of the world in which he is embedded. He already has a sense for injustice, and a somewhat bewildered unwillingness to accept it in himself, his associates, or their society. Still, there’s room for argument here – how Kellen will conduct himself when the pressure is on, and what he actually believes in – well, that becomes clearer over the narrative. Watching him inch toward the person he has the potential to be – for good or ill – is delightful, and convincingly constructed. In this he’s aided by the fantastically named Feruis Parfax, a woman from one of those far off lands. She’s a little mysterious, obviously clever, and has a tendency not to take any crap from self-entitled magelords. With a waistcoat, a hand of cards, and a penchant for drawling insults, Parfax puts me in mind of a cockier member of the Magnificent Seven. She has an energy and confidence that some of her antagonists’ lack – and also a kind of sorrowful, knowledgeable compassion, which contrasts with what the oasis society paints as necessary cruelties. Parfax is a lot of fun to watch – a sharp-eyed, sharp tongued drifter, with an intolerance for injustice, and willingness to do something about it. That she relies on wits and technology helps keep her approach fresh and interesting. That she’s often laugh-out-loud funny is a happy side-benefit. The duo are thrown together initially, and watching the banter and cultural confusion as they acclimatise to each other – well, it’s entertaining, and often thought provoking. They do seem unable to keep out of trouble in one fashion or other, and that certainly kept me turning pages. From a plot standpoint…well, as ever, I’ll try and avoid spoilers. It’s part coming of age story, and part magic-western. There’s some fantastic confrontations against the odds, and possibly the tensest, funniest magical duel I’ve ever read. There’s investigation of a burgeoning conspiracy, with red herrings and blind turns scattered about – at the same time as Kellen slowly comes to terms with who he wants to be, and quite what the society he is immersed in has become. . In short, it’s a compelling story, charmingly and grippingly told. It’ll make you chuckle, make you think, and quite possibly make you cry – and for that, I’d say it’s highly recommended. 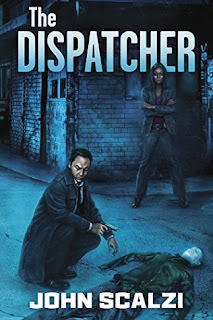 The Dispatcher is a new novella by John Scalzi. Seemingly unrelated to his other works, it sets out a mystery in a world where anyone deliberately killed will return to life. The world that Scalzi’s built is, in some ways, familiar. There are hospitals, doctors, nurses. There are police struggling to enforce the law, and criminals working just as hard to evade it. The central conceit though, is this – that people removed from life by violence don’t, typically, die. They find themselves back in their homes, without their clothes – but definitely still alive. Nobody seems to know why this is now happening – but it’s a fact. A fact which has led to social change, and the creation of the Dispatcher – people whose job it is to eliminate people before they die naturally, in order to allow them to return to life. Dispatchers are a people approached with caution, somewhere between social pariah’s, a priesthood, and average government employees, struggling with paperwork. It’s this change, the sense that death isn’t always forever, that defines the narrative – and it’s also an inventive core to spin that narrative around. Our protagonist is Tony Valdez, who works as a Dispatcher. Valdez is cynical, ground down by life, and perhaps ever so slightly crooked. Having said that, he’s perceptive and clearly intelligent, and a rather keen eyed investigator. There’s a Sam Spade feel about Tony, as he reluctantly allows himself to be dragged into looking for a missing person; it’s less that his armour is no longer shiny, and more that he never had any to start with. That said, he seems to be a straightforward individual, neither hero nor monster – but projecting himself as a working man, simply trying to make enough to put food on the table. Of course he also kills people for a living. It’s interesting to see a man work to remain reformed, to keep out of the sort of unfortunate deals which he would absolutely deny having taken part in before. It helps that he’s also a man with fairly firm ideas of friendship – where that doesn’t conflict with his understandable desire not to be killed himself. Tony isn’t charming, but he is resourceful, smart and edgily witty – and rather interesting to follow around. He’s backed up by a supporting cast with similarly noir undertones. There’s the Detective who strongarms him into helping with her investigation – unwilling to accept obvious explanations, always pushing and digging into vague answers. 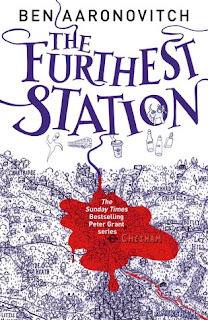 She’s a good foil for the laconic Valdez, and adds a sharp wit of her own to the story. The banter between the Dispatcher and the Detective ranges from philosophical, to dark, to laugh-out-loud funny, often over the course of a few sentences. There’s other figures here as well – from organised criminals to decrepit millionaires. A couple are pitch perfect, their shrouded motivations wrapped in a familiar-seeming humanity. There’s a sense of ambiguity that pervades the cast, and it’s one that pays off over the course of the text. The plot – well, no spoilers. But in a world where no-one dies of violence, Valdez is looking into the disappearance of a fellow Dispatcher, an old friend. The central mystery is rather clever – I was unwilling to stop turning pages, being dragged long on Tony’s investigation. There’s false leads, and red herrings, and some shockingly tense and emotional moments, with an ingenious central mystery under a stylistic layer of sci-fi noir. It’s rather fun, and if that sounds like your sort of thing, I’d recommend it. I’m certainly hoping to see more of Valdez and his world in the future. Regular readers of this blog may already know that I’m a big fan of K.J. Parker. As such, I’ve been really looking forward to “Mightier ThanThe Sword”, his latest novella. The world may be familiar to several readers – it shares a geography, if not a time period, with the currently ongoing “Two of Swords” serial, which has certain similarities to the East and Western Roman Empire(s). It’d a space where there are religious entities, which control knowledge – or at least the physical artifacts of knowledge. Books, the chains that attach them to shelves, and, seemingly, the education to go with them, all have a focus on monasteries. There’s an entire culture at work here, sketched in reader presumptions with a few high notes – so we see the protagonist speak with the Empress, and discuss the raiders coming out of the seas and targeting institutions of knowledge. It’s a small geography, but skilfully constructed, and the thematic notes are familiar if you’re aware of the wall of the Roman west.There’s a sense of decay at work here as well – or at least of entropy, as roads and institutions constructed in other times are no longer of the expected quality, slowly falling into the morass of mud amongst the deconstruction of the systems which support them. Parker has always been happy to show how governments are complex systems which allow people to survive – and equally happy to show how the disintegration of those forms is inevitable. Still, this is a space where, if the fringes of the central polity are decaying, the political core is still both active and heavily armed. This is a world that reeks of mud, deserts and religion, one where governmental authority is centralised across a distributed system, and one where there is a defined cultural border between those inside and, well, others. Our protagonist is the nephew of the reigning emperor. As with quite a few Parker protagonists, he has a wry self-awareness that’s a joy to read. There’s shades of Wodehouse in his abject refusal to accept responsibility or intelligence as his own qualities, striving instead for a sort of aggressive mediocrity. Still, he’s clearly both privileged and intelligent, taking the reader along on a series of investigations into raids on monasteries; his thinking is lucid and easily explicable, and makes sense when you read it – that he refuses to think of this as anything more than standard is both a compliment for and an indictment of the society he exists within. Our protagonist is an impulsive charmer, with an intelligence which is diffuse, but keen if focused. As ever, with Parker’s protagonists, he feels about as smart of the reader, at least until he’s not. He’s also a man with a degree f laziness and, if not political conviction, a grasp of reality, enforced by his position – relative of an Emperor. I wouldn’t say his character moves toward clarity over the course of the tex, as much as it is revealed to the reader. But across it all, we have a narrator who is clever, charming, and makes logical sense in a world which, as discussed, is becoming increasingly illogical. The plot – well, it’s part high politics, part blood-and-guts, and part personal drama. The battles are baffling, kinetic, and carry the sort of sense of risk and consequences one might expect. This is a world where everything is accepted as a business of sorts, and everything has a cost – be it in gold or blood. There’s some serious army action here, and if the blood spatter isn’t close at hand, the futility and random nature of conflict certainly is. The politics operates further beneath the surface, informing the stabbing and flights of arrows – but I requires a bit of thought to follow exactly what’s going on, and who is doing what to whom – and why The personal stories impact on both, particularly those of our protagonist, whose actions are rather likely to have geopolitical connotations. As ever though, the skill is in tying all of the threads together. Whilst I wasn’t entirely surprised by the close of the narrative, there were certain aspects I didn’t see coming. If you’re already a fan of Parker’s, then this is an excellent addition to your collection – incisive, erudite and vicious. If you’re looking for something new, this is a great introduction to the tone and focus of his work. In either case, I’d argue that the style and tone are spot on, the plot compelling, and the narrator convincing. Pick this one up, and give it a read. 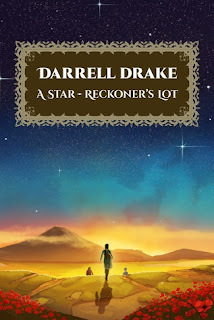 A Star Reckoner’s Lot is a fantasy novel by Darrell Drake. It’s set in Sasanian Iran, imbuing it with a mythic feel. This is assisted by the use of astronomy as functional magic, and the appearance of a great many seemingly supernatural monstrosities. The world feels like a hard-edged version of the Thousand and One Nights. The supernatural is a pervasive and accepted part of life. There’s a strong dualism at play, between servants of the Truth, and servants of the Lie. The former are typically the authorities of humanity – kings, noblemen, driven by a desire to bring peace and order. The latter are a diverse group of murderous supernatural creatures, generally referred to as “Divs”. They range from murderous snake-women, to insect-like soul feeders, and forty-armed titans, bent on the destruction of humanity. This is a world where the sword and spear have a place, and martial virtue is prized – but it runs alongside a strand of morality which prizes order against chaos. This is a world where the border between the real and the unreal is tenuous at best, where dreams and illusions are likely to carry truths and to bite back. There’s a sense of the familiar here, wrapped around the close friendships and affections that people share – but accented by the strange – marriages between siblings, or the ability to draw on the alignment of the stars to wreak devastation upon ones enemies. 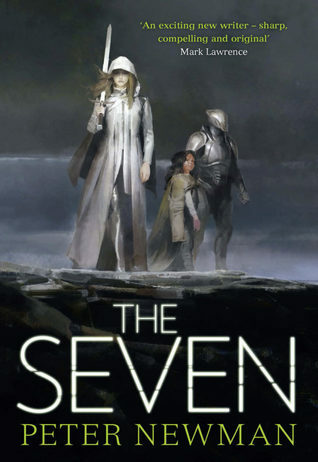 It’s certainly in a unique epoch, and its blend of the familiar and an unfamiliar culture makes for an intriguing read. The protagonist is Ashtadukht (henceforth Ashta), the titular star-reckoner. Ashta isn’t a particularly good star-reckoner. She draws on the power and wisdom of the stars, and sometimes it works perfectly – she might reveal a murdered; often at the same time, it may not work as expected – the revelation may be made by a tunnel of fire which plows through a wall before incinerating the culprit. There’s power there, and she struggles with its unpredictable nature. She’s driven in her quest to defeat the div who killed her brother. The emotions that propel her down this path are seldom visible, but lurk like icebergs in the conversations and observations that she makes to her travelling companions. She’s also notably merciful; a star-reckoner’s job is to exterminate divs and half-divs, servants of the Lie. Ashta has a tendency to slap them around and send them packing, but has a capacity for forgiveness which is uncommon. Watching her try and square this circle, a desire to do right by the divs and her own quest for vengeance, wrapped in the emotions she has for her departed brother, surrounded by an unpredictable power – well, she’s certainly full of surprises. Sometimes it’s difficult to work out exactly what she’s feeling – but a lot of the time, it doesn’t seem like she’s entirely sure either. She’s joined by her companions – her straight-laced cousin, who bears her some affection, and Waray, a half-div and general murderous lunatic. The former is led by duty, and cares for Ashta as family. He’s the foil for AShta’s slightly divergent opinions, and a brook against Waray’s excesses. The half-div, by contrast, is a mystery, of sorts. She speaks cryptically, or at least vaguely, and seems unable to provide a straight answer to most questions. She’s also given to utterly appalling (though for the reader, often hilarious) pranks. There’s a suggestion at the start of the text that something isn’t quite as it seems in the life of Waray – or indeed that many things aren’t – and this is one of the character mysteries that drive the narrative. The plot moves across the years, blending seamlessly between chapters. It can be tricky to tell how much time has passed, but that actually fits into the mythic tone of the story. But it follows Ashta and her companions as they journey around Iran, seeking out divs causing trouble and trying to prevent it – whilst keeping an eye out for the one which ended Ashta’s brother. There’s a lot of opportunity for reflection in here, and some great bantering character sections. But there’s also some truly impressive magic, and debates around truth and morality. These are, though, mixed in with duels, the occasional siege, and a non-zero amount of derring-so. It’s a complicated story, this one, with depths that deserve to be plumbed in a second or third reading. But it’s also an adventure, a tale of heroism and villainy, battle and betrayal. It’s a fresh voice, and one which deserves to be heard. Give it a shot.